Many traditional utility organizations structure themselves according to assets or functions, which seems logical — after all, it is easy to see the company as comprising major assets and people. For a small utility with limited growth potential, this can often be the right approach. However, for larger, more complex utilities, this mindset potentially leaves value on the table. For these businesses, there is another way: They can reinvent themselves as portfolio managers of multiple (but discrete) lines of business that were otherwise hidden in the broader business. This approach provides sharper commercial focus and unlocks enormous latent potential. The assets are the foundation of any utility. Balance sheet-aware asset managers generally regard themselves as stewards of the assets that serve the public, and they focus on the key functions that undertake the work of maintaining those assets. So it is no surprise this mindset manifests in operating models that are defined by asset classes and critical functions (e.g., asset management, network operations, field services). An asset-centric or function-centric utility will often dismiss suggestions that it is not commercially focused. But in our experience, a mindset dominated by assets and functions can stymie utilities’ attempts to maximize commercial performance. Over time, this focus dilutes the line of sight between activity and commercial outcomes. Instead, other priorities start to dominate, such as engineering outcomes. At its extreme, commercial outcomes can be treated as uncontrollable or derived outcomes that are the byproducts of caring for the asset and undertaking core functions excellently. An alternative perspective is to view a large and/or multiasset utility as a portfolio of lines of business (LoBs). In our experience, utilities typically underestimate the number of discrete LoBs they have and they often undermanage them. Explicit recognition and focus allows a given LoB to thrive, and allows the executive team to differentially performance-manage the overall portfolio of LoBs. A given unit of activity can be considered to be its own LoB if it is unique in terms of some combination of cost structure, customers, suppliers, competitors, and market forces and potential. As activities differ more on these dimensions, it is more likely they constitute separate LoBs. Where is profit really made? Is it found in multiple areas? If so, do you manage these areas managed in a unique manner or via a “one size fits all” approach? What is the loudest voice at the executive table? Does it speak to functions, assets or commercial outcomes? Where are the “rising stars” in the business typically found? In the critical functions? Is there a broad suite of commercially focused KPIs that are different between different LoBs? Is it possible to truly see commercial performance for each LoB? Does the executive team regularly discuss which LoBs to invest in or divest? Identifying the right LoBs and choosing where to focus is half the challenge. But to truly enable LoBs to perform, a supportive operating model is required. Resetting the operating model begins with the strategic challenges of defining the portfolio priorities and macro targets for each LoB. This can be an unfamiliar conversation for asset-centric or function-centric utilities. Once these priorities are set, it may seem natural to move quickly to organization restructure. However, we recommend first that considerations be kept at a higher level and definition be given to how the organization “works” at a macro level. In particular, the focus should be on the working relationships between the LoBs, corporate level, and the critical supporting functions. Understanding these relationships will be the best guide to redesigning the operating model. Beyond restructuring, an LoB-centric utility must “rewire” its organization. It is easy to underestimate this challenge because overcoming old ways of working takes time — the strongest organizations can take the most work. We recommend a focus on how decisions are made, particularly the balance in decisions between the LoB owners, the functions and the asset manager. It will also typically involve establishing new processes and information that is needed for the executive team to genuinely act as a portfolio manager of the newly created LoBs. Utilities must always strive for excellence in their core functions and hold themselves to high standards of stewardship of their critical assets — justifiably so, given the public good embedded in those assets. However, exemplary stewardship and shareholder returns are not mutually exclusive. Taking a more commercial approach that focuses on the LoBs where money is made can be a defining change in large, complex utilities. 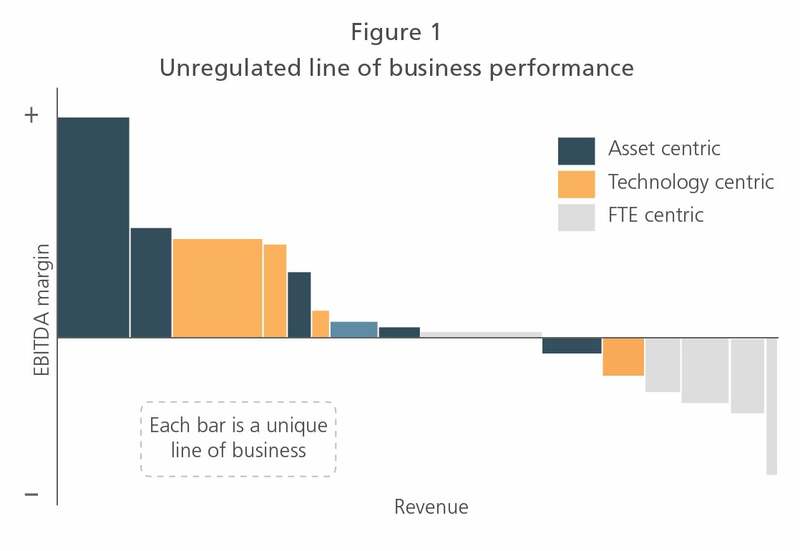 Inverting the focus from assets and functions to LoBs and commercial value can enable utilities to attain a new level of commercial performance. A recent project provides a useful way to summarize our perspectives on the benefits of utilities freeing their inherent, but hidden, lines of business and acting as a portfolio manager. In this project the client was a large multiasset utility that comprised electricity and gas transmission and distribution assets and a selection of asset maintenance services. The company was organized in terms of key functions (e.g., asset management, field force services, regulatory management), and there was a clear emphasis on asset and engineering excellence, which certainly ranked more highly than commercial excellence. In commercial terms, the company considered itself as having two halves: a regulated monopoly network of assets and an unregulated business, which broadly was responsible for any activities not associated with the regulated monopoly network business. Within the regulated business, there were multiple but embedded LoBs. These LoBs were not truly managed in accordance with their differing underlying drivers of profitability. Instead, the strategic and operational settings across them were broadly similar. The unregulated business was managed independently from the regulated business and given a mandate to experiment and grow. We worked with the company to identify and define the embedded LoBs. For the most important and valuable LoBs, we helped establish an operating model to enable the company to act as a portfolio manager and drive each LoB to its full potential. In the regulated business were five discrete LoBs. Three were based on similar asset types. Nonetheless, each differing cost and revenue drivers, varying risk profiles and quite diverse outlooks. Yet all three had been broadly managed in a similar manner, and the commercial outcomes for each were somewhat regarded as a derived outcome based on how the key functions performed. A fourth LoB had its own history and was hamstrung by past issues from which it had not yet recovered. The fifth LoB was already recognized as unique, but it lacked focus and a clear definition of its desired end state. As a result of our review, the regulated business was inverted. It switched from function centric to LoB centric. Clear “business owners” were established for each LoB, along with an overall LoB general manager. Each LoB had its objectives and performance targets refreshed. The restructure changed the dialog between the business and its key functions. The functions now operate to support each LoB in achieving its commercial objectives. More broadly, the change brought about a renewed examination of performance. It led to the instigation of a substantive productivity drive, with significant upside opportunities for one LoB that, with the clarity of the restructure, was found to operate at a relatively high cost compared with industry peers. A deep forensic assessment of the unregulated business also revealed many LoBs. Performance of these had not been closely measured or managed. By rebuilding the commercial outcomes by LoB, we highlighted dramatic differences in profitability, risk and potential across this portfolio (see Figure 1). Informed by this new perspective, underperforming and lower-potential LoBs have been divested. The retained, higher-potential LoBs now have greater focus and better access to capital and management attention. The improved focus means there is huge potential for the company to create the high-margin growth engine that its leaders had been seeking for some time. At the overall corporate level, the executive team now has clear LoB responsibilities. Collectively, they act as a portfolio manager with a structured review and investment cycle to manage performance and prioritization across the portfolio of businesses.